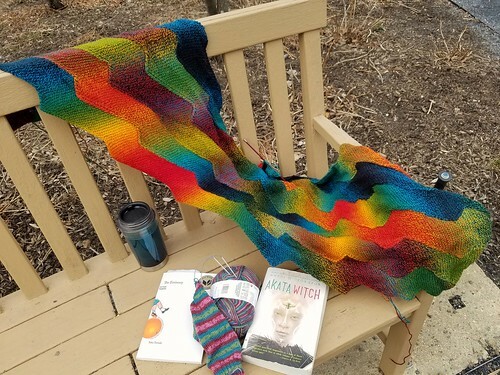 I took my books and knitting up to the park today to get an outdoor shot and some fresh air. My sock is into the heel flap, but I may end up hating how it disrupts the striping once I start the gusset, so I’m trying not to get too attached to the progress. On the reading front, I am still listening to The Woman Who Smashed Codes and am reveling in the D.C. mentions. Tonight it was a restaurant with gendered dining rooms next to the Mayflower Hotel, which sits less than a mile from where I’m typing. The Emissary is overdue, which means I need to finish this novella tomorrow or Friday in order to return it to the library. I would still not use any of the whimsical adjectives attributed to it, so I’m hoping that feeling appears in the second half of the book. I started Akata Witch by Nnedi Okorafor last Friday. Its titular character is an American-born albino Nigerian who discovers she has magical powers and I am enjoying it so far. Head over to As Kat Knits to see what other people are reading and knitting.